Welcome to The Omega Man Technology blog. I’m totally fascinated by many aspects of technology, especially off-grid energy such as solar power, wind and thermo-electric. In this blog, I intend to share some of my experiments with anyone interested or bored enough to read my ramblings. The Omega Man used to drive an electric, plug-in hybrid – The Vauxhall Ampera, also known as the Chevy Volt. After nearly three years of driving it, I’ve confirmed my suspicion that it’s almost the best thing since pizza and beer. After about 22,400 miles, the total fuel cost has been around £800! – most of the electricity was free on public charging points. As I know many other people have been doing, I have been following the fortunes of the Tesla Motor Company run by real-life, Tony Stark, AKA Elon Musk. 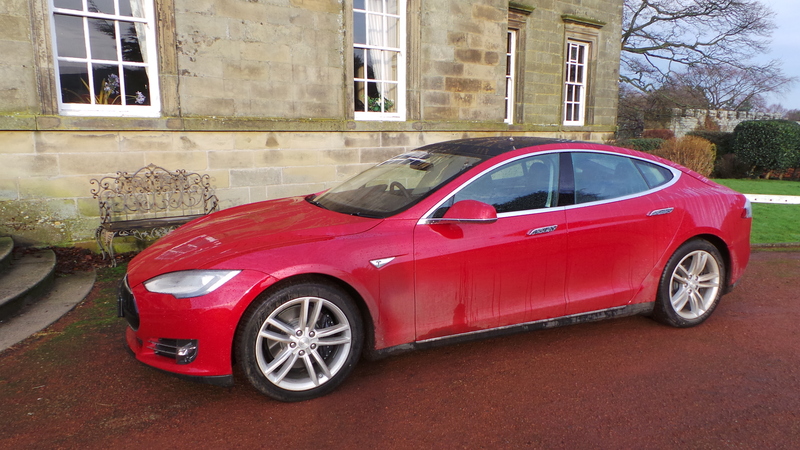 Well, back in March, I took the plunge and ordered a Model S.
I went for the 85D with full tech pack plus all the winter options and four wheel drive. After a test drive in New York, New York and another in York, Yorkshire at a road show, I was totally hooked. 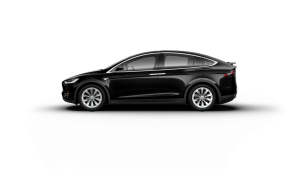 I’ve always been more of a 4wd type of gadgeteer, but I’m getting well into this electric vehicle stuff and, of course, the Model X is just around the corner. 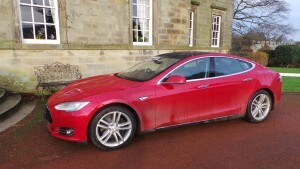 So, here we are nearly nine months later and my Model S has arrived! I had to take a one-way train journey to Birmingham along with Mrs Omegaman to collect it as, bizarrely, until next week there are no garages north of Brum – there’s one opening in Edinburgh next week. If I could have waited another week, I could have done the 1 hour trip to Scotland instead. However, like all gadgeteers, a week is a long time when the new toy has been ordered. Sadly, a couple of days after collecting Sparky2, I had to go into hospital to have a torn ab-muscle repaired, so I can’t drive for another few days. My main business is centred around property – I build and run luxury holiday cottages in Northumberland. I also have a big country house wedding venue (Ellingham Hall). My new business is Thinking Thermostats which is where I’m marketing a radically new type of self-programming heating controller / thermostat which has saved us a fortune in heating gas and was designed by me here at Omega Towers. As you’ll see from some of the other sections of this blog, I’m also into self-sufficiency. This has two roles:- cost reduction and non-dependence on manufactured foodstuffs. I’ll be sharing some of the experiences that we have along the way. 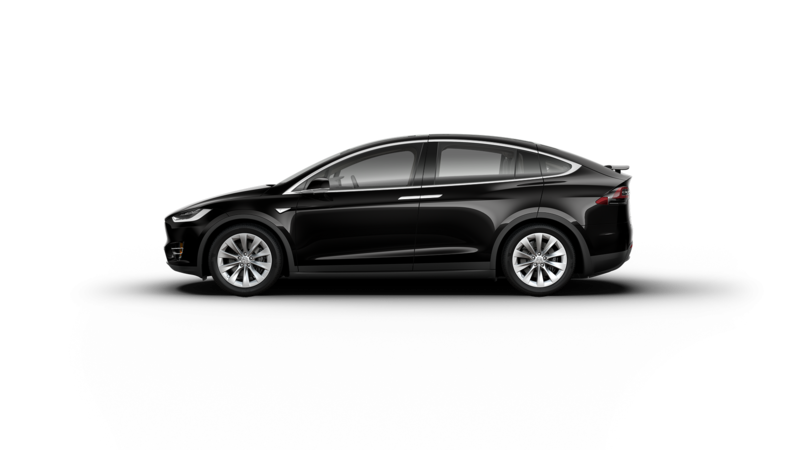 I have a delivery date for my new Tesla Model X! Yes, folks, I liked the first one so much that I’ve ordered another…well, the new one. It’s more of an SUV rather than a sports car, but I think that matches my rufty-tufty lifestyle far more accurately. After all, the Model S is great on the road, but you wouldn’t want to go camping with it, unless it was at a Glastonbury glamping site. So, here it is (at least a pic of what it will look like when I get it at the end of April 2017). I’ve gone for the 90D, which is once again four wheel drive (what else? ), the usual ridiculously powerful pair of electric motors and the new Autopilot 2. Apparently, the new version of the autopilot has four radars and 8 cameras and will have full autonomous drive capability when (a) they finish the software and (b) the Government allows it to be used on the roads. It’s got black paintwork with a completely black interior and is so totally gangster you wouldn’t believe. I wanted those twirly wheel hubs in black as well, but the salesman just put his foot down and said that fe couldn’t in good conscience sell me such an abomination.